After some massive stars run out of nuclear fuel, then collapse and explode as supernovas, they leave behind dense stellar nuggets called "neutron stars". Rapidly rotating and highly magnetized neutron stars produce a lighthouse-like beam of radiation that astronomers detect as pulses as the pulsar's rotation sweeps the beam across the sky. Since Jocelyn Bell Burnell, Anthony Hewish, and their colleagues first discovered pulsars through their radio emission in the 1960s, over 2,000 of these exotic objects have been identified. However, many mysteries about pulsars remain, including their diverse range of behaviors and the nature of stars that form them. New data from Chandra are helping address some of those questions. A team of astronomers has confirmed that the supernova remnant Kes 75, located about 19,000 light years from Earth, contains the youngest known pulsar in the Milky Way galaxy. The rapid rotation and strong magnetic field of the pulsar have generated a wind of energetic matter and antimatter particles that flow away from the pulsar at near the speed of light . This pulsar wind has created a large, magnetized bubble of high-energy particles called a pulsar wind nebula, seen as the blue region surrounding the pulsar. 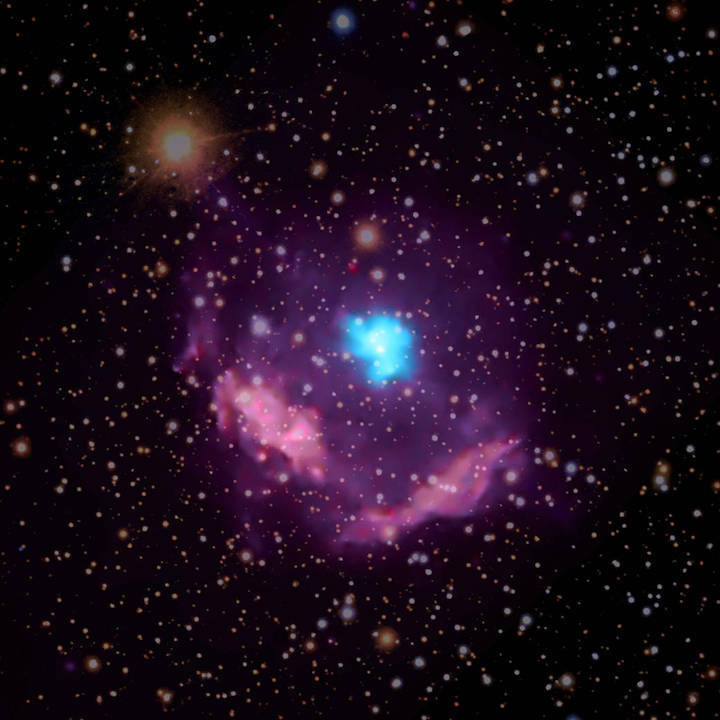 In this composite image of Kes 75, high-energy X-rays observed by Chandra are colored blue and highlight the pulsar wind nebula surrounding the pulsar, while lower-energy X-rays appear purple and show the debris from the explosion. A Sloan Digital Sky Survey optical image reveals stars in the field. The Chandra data taken in 2000, 2006, 2009, and 2016 show changes in the pulsar wind nebula with time. Between 2000 and 2016, the Chandra observations reveal that the outer edge of the pulsar wind nebula is expanding at a remarkable 1 million meters per second, or over 2 million miles per hour. This high speed may be due to the pulsar wind nebula expanding into a relatively low-density environment. Specifically, astronomers suggest it is expanding into a gaseous bubble blown by radioactive nickel formed in the explosion and ejected as the star exploded. This nickel also powered the supernova light, as it decayed into diffuse iron gas that filled the bubble. If so, this gives astronomers insight into the very heart of the exploding star and the elements it created. The expansion rate also tells astronomers that Kes 75 exploded about five centuries ago as seen from Earth. (The object is some 19,000 light years away, but astronomers refer to when its light would have arrived at Earth.) Unlike other supernova remnants from this era such as Tycho and Kepler, there is no known evidence from historical records that the explosion that created Kes 75 was observed. Why wasn't Kes 75 seen from Earth? The Chandra observations along with previous ones from other telescopes indicate that the interstellar dust and gas that fill our Galaxy are very dense in the direction of the doomed star. This would have rendered it too dim to be seen from Earth several centuries ago. The brightness of the pulsar wind nebula has decreased by 10% from 2000 to 2016, mainly concentrated in the northern area, with a 30% decrease in a bright knot. The rapid changes observed in the Kes 75 pulsar wind nebula, as well as its unusual structure, point to the need for more sophisticated models of the evolution of pulsar wind nebulas. A paper describing these results appeared in The Astrophysical Journal and is available online. The authors are Stephen Reynolds, Kazimierz Borokowski, and Peter Gwynne from North Carolina State University. NASA's Marshall Space Flight Center in Huntsville, Alabama, manages the Chandra program for NASA's Science Mission Directorate in Washington. The Smithsonian Astrophysical Observatory in Cambridge, Massachusetts, controls Chandra's science and flight operations.